Finished this during the livestream today! I wish I could have had time to draw more Christmas-themed stuff... In any case, Merry Christmas, everyone!! I find I quite like designing winter clothes for some reason~ Maybe it's the complexity of layering or the various materials. I'm not sure. The colors really bring this drawing together. I love the design of his outfit. The belts and gold parts of his gloves are wonderful. The winter scene behind him is great. Nice work. You're welcome. Maybe your drawing should be called "Mysterious Gift Giver", since you asked what it could be called. 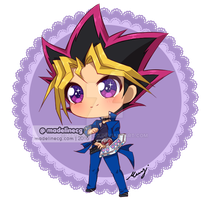 We love Yami x Anzu!